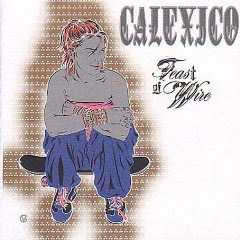 Calexico has got a really attractive mix of sounds, and that is particularly true of this album. There is still all the mariachi stuff but with that there is the Portishead style of Black Heart of the great jazzy stuff of Crumble. In fact the album's sound is so varied that it could be seen as unfocused, but it never is. Calexico maintain a constant mood throughout, slightly dark and nostalgic it is also very beautiful stuff. So this is a really worthy album of pop-folk-country-world-rock-jazz-trip-hop-stuff. It manages to be innovative without ever being unpleasant, it manages to invoke stuff like Tim Buckley without being derivative and it is a thoroughly enjoyable album. A hidden instrumental track--"Untitled" -- 2:16--is in the album's pregap. Totally agree. This is a moving and beautifully crafted album. Gentler than Giant Sand and in my top list as well.